Standing 7' tall this human figure sculpt was a detailed but budget friendly rendition of Michaelangelo's, David sculpture. Note: Attachments would be made differently on the Trojan sculpture. In this sculpture I would like to point out the drapery, which relates to the drapery on the Trojans cloak. 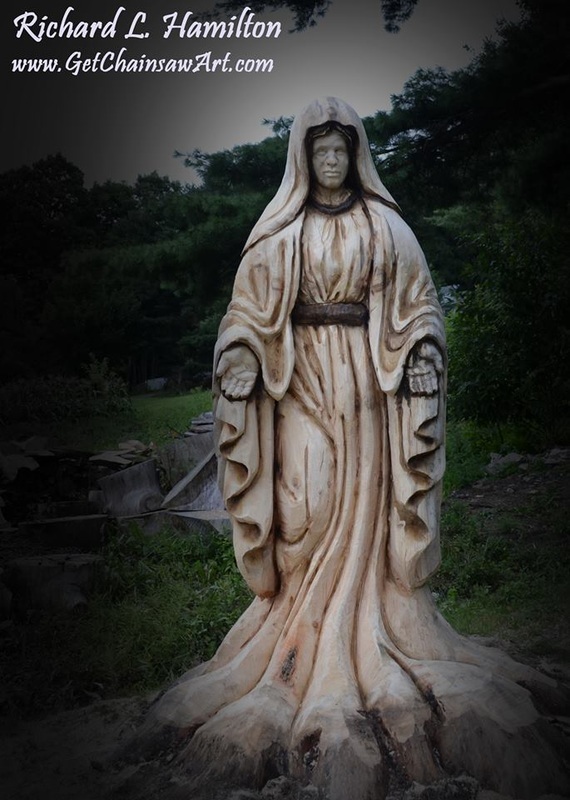 This was a 2 day on-site job, resulting in a beautiful residential sculpture at an affordable price. 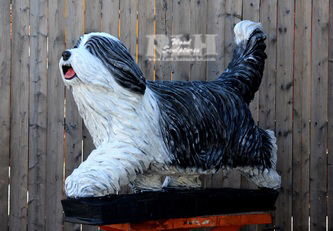 Though this sculpt has nothing to do with a human figure, it shows a high likeness of a dog. 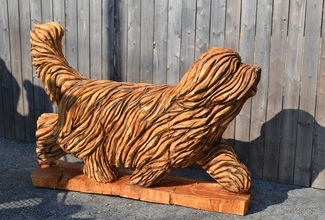 The lady who ordered this Bearded Collie breeds show dogs and had exact dimensions for the entire dog sculpture and wanted a very specific pose, he executed it to the 'Tee' for her! 7' knight Richard carved last Fall as a semi-quick carve piece for display at our shop. Recently it was dry brushed and sold. This is a recent project that Richard wanted to do for FUN. It showcases how much detail you can actually get with a chainsaw and just a few other tools. Also notice how he carved the smaller version and quickly turned around and made the larger version to look very similar, but choosing to make just a few pose adjustments.